I recently wrapped up this session of Adult Drawing at University City Arts League, ended one and started a new session of Advanced Drawing for kids in the same space, completed my Art Futures residency with The Philadelphia Museum of Art, finished teaching this semester at Moore College of Art & Design, tabled at the Lawrenceville High School Comic Con, and along with the rest of Girl Crime Organization, held a show at Tattooed Mom and wrapped up our pop-up gallery on South Street. I was also featured as a caricature of myself in Craig Campbell's "How To Draw A Black Lady." Thanks, Craig! Left: A drawing from one of my Adult Drawing students at UCAL. Right: My Art Futures class and I, their comic presentation, and one of them receiving an award on behalf of her workshop group. Art Futures is an artists-in-residence program sponsored by The Philadelphia Museum of Art. 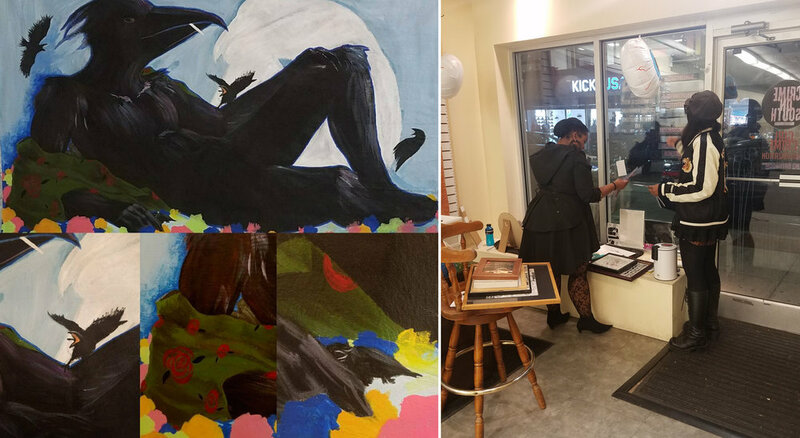 It gives Philadelphia students the opportunity to learn from local artists in their own schools, and to create a project to be exhibited in a public space. 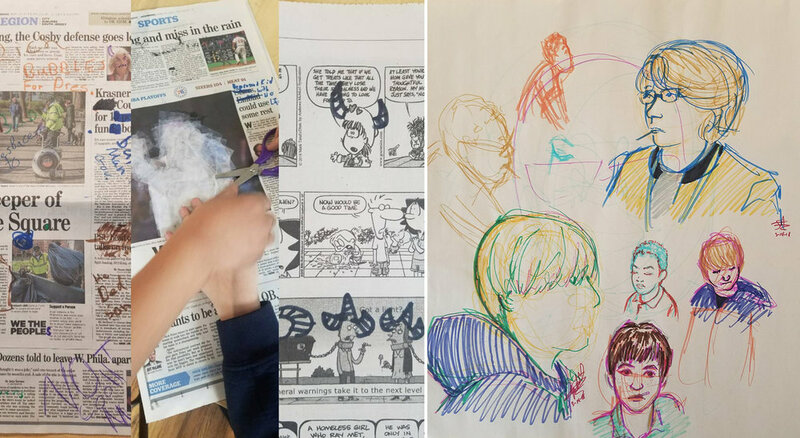 I worked with Little Flower High School this semester; using pieces from the PMA collection as inspiration, the students made comics centered on social issues close to their hearts. The work they produced was beyond anything I could have imagined, and I am so grateful to have had the privilege of speaking to them about how to build comics from the ground up, representing their own stories, and free speech and censorship in comics and graphic novels. Left: The students created Nancy Chunn-inspired news responses on the local paper. Right: I drew some of the students during class. They're fun to put down on paper. In addition to the kids' Advanced Drawing class (which usually ends up in a lengthy discussion on politics or morality - 10 year olds are serious these days! ), I also teach the Adult Drawing class at UCAL. It's a ton of fun, and I love when people who've never picked up a pencil in their lives learn to understand line, shape, and contour. I assume it's akin to parents watching their child learn to walk. The world suddenly becomes bigger. That probably sounds pretentious. I don't care. Left: The poster for GCO's show a Tattooed Mom, designed by Mechanical Pencil Girl. Right: GCO's flyer for our pop-up on South St, designed by Tia Gutss. Process pics of my "Birdman" piece (5'x3'), and closing down the gallery. Human: "Hey! What is this?" GCO member: "It's a pop-up art gallery. There's about 8 of us working as a collective. Take a look around, see what we do." H: "Cool. How do I get my stuff in here? I make [insert random thing here]." GCO: "...Why don't you take a look around first, and then we'll talk about your stuff." H: "No, yea, I will. But, like, can I sell my stuff here?" 9 times out of 10, a visitor in the above situation would take convincing to actually look at our work, and even then, it was only as a cursory glance before deciding it was too hard to convince us to sell their work out of our space without even showing us said work. And 9 times out of 10, once we looked up the contact info they left, their styles weren't a good fit. Regardless, I loved working with the artists in Girl Crime Organization. They're an incredibly talented and interesting group with whom to create and exhibit work, and while our styles are vastly different, we all come in with respect and the ability to critique each other's pieces to help us all grow. We're like Megazord, but with a cute skirt and an Art History degree. The pop-up was a fun experiment, and the show at TMom's was a nice departure from our usual schedule. Thanks TMom! There's not much to say here, except I friggen love teaching After Effects. It's a monster program that brings me so much joy, and my students this semester were the absolute best! They make me laugh, they make me think, and sometimes they confuse me, but I'm cool with that as long as they're learning. Left: Our setup. Three artists tabled this and last year: Jessie Musto and Aremo Massa. Right: Aremo teaches students how to create their own mini-comics. Lawrenceville is a wonderful space to table a small con. The students and staff are always respectful, helpful, and interested in the arts. The school does a lot to bring these kids fun activities, and I'm always happy to be a part of that. ALL THE REST OF THE STUFF! A portrait commission for a friend. 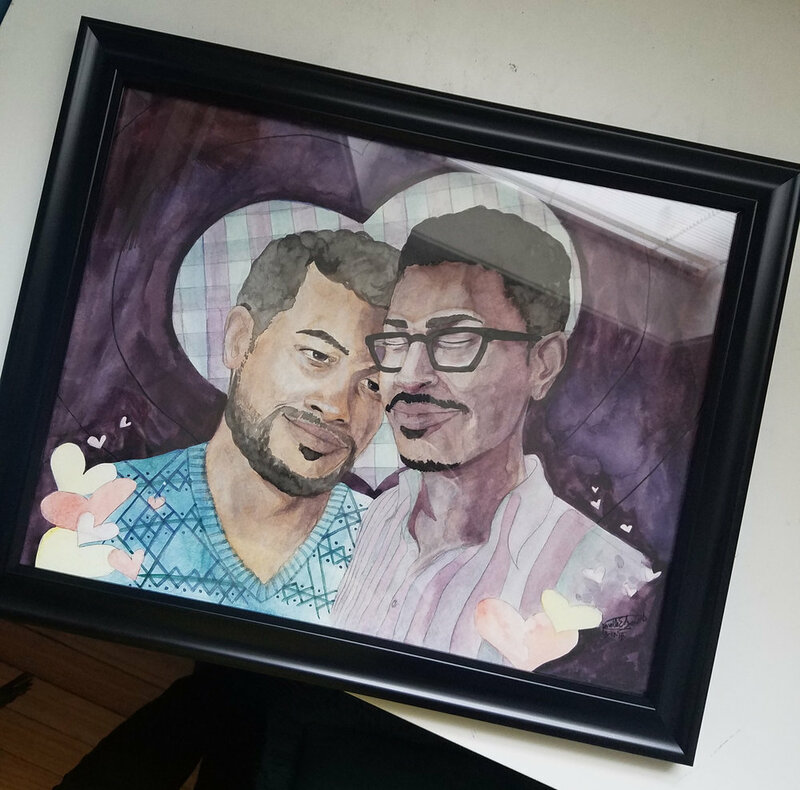 Thank you, lovelies, for letting me paint you for your anniversary! Left: A carrot cut into a flower, given to me by a coworker on a very long day. It was delicious. 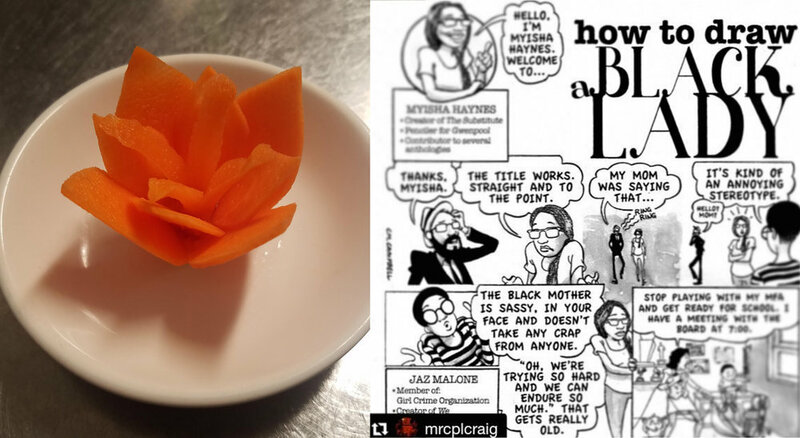 Right: How To Draw A Black Lady by Craig Campbell for Hyperallergic, in which I have a cameo! That one day I thought I looked cute VS how my cat felt about it. It's cool, Qat. You don't have to love me. I love me. Most days, anyway. So there. I'm hoping the next 4 1/2 months won't be quite as stressful, but will produce just as much joy. Let's find out!